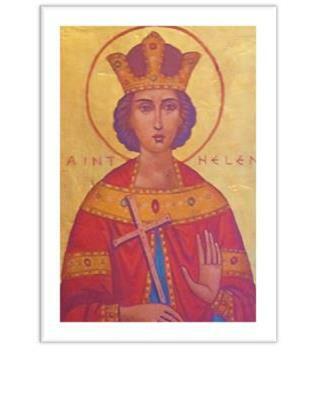 In our Church is this old icon of St. Helen, who was the woman who uncovered some of the greatest archaeological treasures of the Church, and who ordered the construction of some of the greatest Christian basilicas in our history. 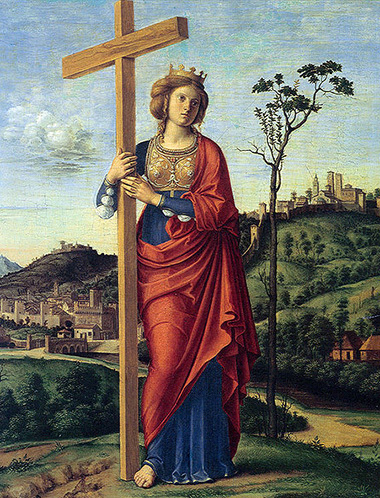 She was credited with discovering the long-lost True Cross that had been obscured by the empire in a vain attempt to make Christians forget about the sacrifice of our Lord. But in time even the emperors would become Christians. 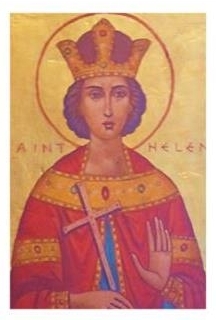 St. Helen lived during this time when the Church was rising to ascendancy, and she was the mother of the Emperor Constantine, who legalized Christianity in the empire. As the emperor’s mother, Helen became easily the most powerful woman in the world in her day. But even before Constantine had become emperor, Helen had hovered near the height of the government based on her marriage, and yet her spouse eventually abandoned her. The imperial government had forced her pagan husband to divorce her so that he might remarry for purposes of better political alliances, and thus Helen was left alone. Her heroic Christian faith pulled her through this challenge, even at a time when faith in Christ could invite martyrdom, and today she is honored as one of the great saints of the early Church. St. Helen never remarried, but the circumstances around her civil divorce would make it possible for us to procure an annulment for her today if she wanted one. So what then, is an annulment? Is it the same thing as a Catholic divorce? No. As you can see, an annulment is altogether different from a divorce. A divorce is a purely civil matter and terminates a valid civil marriage. An annulment is an ecclesiastical matter and does not terminate a valid marriage but declares that a valid marriage never existed. In reference to Jesus’ teaching about the indissolubility of marriage, a person whose marriage has been declared invalid (i.e. “null”) would not be committing adultery by entering into a “new” marriage inasmuch as the first attempted marriage was never valid. He or she is not “bound” by the prior attempted marriage and so is free to marry. Any time a Catholic wishes to marry in the Catholic Church, whether he or she is marrying another Catholic, a non-Catholic Christian or a non-Christian, the priest or deacon who is guiding the preparation for marriage must make sure that each party is free to marry, in other words that neither party has a prior marriage. If there is a prior marriage, the Church will not be able to marry the couple in deference to Jesus’ teaching about the indissolubility of marriage and the sin of adultery. So let us take for example St. Helen’s case. If we were going to try to procure an annulment for St. Helen we might start by pointing out to the tribunal that neither she nor her husband had been baptized at the time of their marriage, and that she was likely baptized only after their marriage. Moreover they were probably married originally in a pagan or secular ceremony. These are starting points, and might be ways we could advocate for Helen’s annulment (that is if she had asked). St. Helen never asked for an annulment as far as we know, and she never remarried. She remained a chaste woman after her divorce. She lived an active Catholic life and she is a great saint of the Church. Today, if one is Catholic and is abandoned by his or her spouse and thereafter divorced, the Church, while acknowledging that the couple is no longer married in the eyes of the state, still regards the couple as married in the eyes of God. Such a person is able and encouraged to live out his or her Catholic faith to the full. All of this may be confusing, we know, but keep in mind that there is a lot of confusion out there about marriage too, as well as much misinformation about annulments. Each divorced person has his or her own specific story to tell (like St. Helen) and the specific circumstances of each of those stories make it hard to speak about annulments in a general way. Thus one really needs to talk personally to a priest, but sometimes it helps to read a few things first to get a feel for the process. That is why you’re reading this, we know. Still, if you want to understand this process more, we invite you to call our pastor, or click on the link below to begin to explore more about the process. These days the divorce rate is so remarkably high that it is clear that there is grave confusion about marriage in our age. If you are someone whose family has been wounded by divorce, and if you want to seek healing and closure from the perspective of the Church, we want to help.